The plan was to add three feet of height to allow the installation of a hydraulic lift so we could park a third car up high. The small size of the garage meant that the lift would have to take up very little floorspace and this was a problem. Fortunately we discovered single post lifts and our prayers were answered! To support the lift, a new concrete floor would need to be poured. Proper lighting would also be installed and electrical was to be run where it would actually be useful. The old door would be replaced with a taller one, and for the first time the garage would be fully insulated and climate controlled. All the extra height on the wall opposite the lift would be used as a loft for storage. With the plans drawn, all that was left was to start breaking stuff! Just before the demolition. 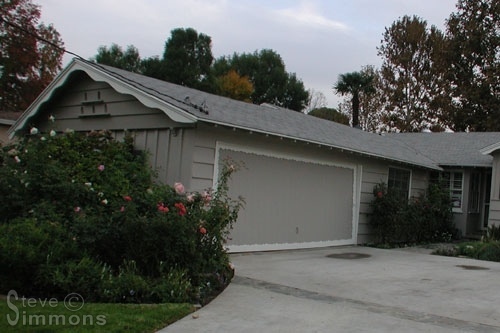 You can see how the garage roof is the lowest point of the house. Also notice that the door also doesn’t close properly. This is a killer in the Summer because hot air flows in, and it also lets in dust and bugs. The new garage would have a completely sealed and insulated door. This photo was taken a few years earlier than the previous one. There was barely room for one small car let alone four! There wasn’t even a work bench nor was there room for one because of all the “stuff” in there. 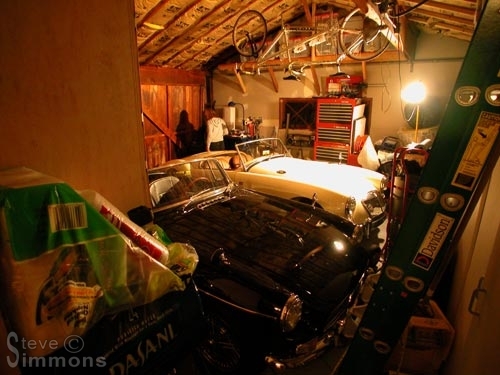 It was a miserable task trying to get any real work done in this garage, or even to keep it clean. This is the kind of tidy garage I’ve kept in the past. You can imagine how the current one was sucking my will to live. 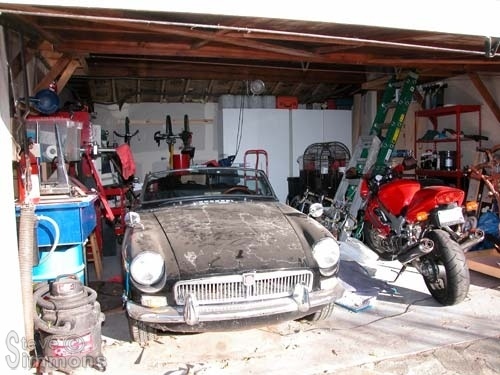 Normally there would be an MGB on the right side of the photo.